Almighty ever-living God, who choose what is weak in the world to confound the strong, mercifully grant, that we, who celebrate the heavenly birthday of your Martyr Saint Agnes, may follow her constancy in the faith. Through our Lord Jesus Christ, your Son, who lives and reigns with you in the unity of the Holy Spirit, one God, for ever and ever. St. Agnes (c. 304) like St. Cecilia, is to be numbered among the most famous martyrs of Rome. When the Diocletian persecution was at its height, and when priests as well as laymen were apostatizing from the faith, Agnes, a girl of twelve, freely chose to die for Christ. When she was commanded to offer incense to false gods, she raised her hand to Christ and made the Sign of the Cross. When the heathens threatened to bind her hand and foot, she herself hastened to the place of torture as a bride to her wedding feast. Pain had no terror for her—although the fetters slipped from her small hands while even the pagan bystanders were moved to tears. When the son of the Roman prefect offered to marry her, she replied: "The one to whom I am betrothed is Christ Whom the angels serve." When the executioner, who was to behead her, hesitated, she encouraged him with the words: "Strike, without fear, for the bride does her Spouse an injury if she makes Him wait". 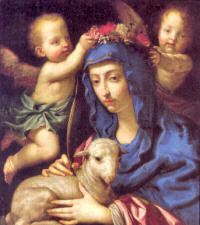 The name of "Agnes" means "lamb-life," and hence the lamb is the symbol of the modesty and innocence of the virgin-martyr. Our saint's name should be traced to the Greek hagne - the pure, rather than to the Latin agna - lamb. But the Latin derivation prevailed in the early Church. The reason may have been that eight days after her death Agnes appeared to her parents with a train of virgins, and a lamb at her side. St. Augustine knew both derivations. "Agnes", he writes, "means 'lamb' in Latin, but in Greek it denotes 'the pure one'". The Latin interpretation occasioned the yearly blessing of the St. Agnes lambs; it takes place on this day in the Church of which she is patron, and the wool is used in weaving the palliums worn by archbishops and, through privilege, by some bishops. In the church built by the Emperor Constantine over the saint's grave, Pope Gregory the Great preached a number of homilies. Reliable details concerning the life of St. Agnes are very few. The oldest material occurs in St. Ambrose's De Virginibus, parts of which are read today at Matins. The value of the later (definitely unauthentic) "Passion" of the saint is enhanced by the fact that various antiphons and responsories in the Office are derived from it. From such liturgical sources we may construct the following "life of St. Agnes". One day when Agnes, then thirteen years old, was returning home from school, she happened to meet Symphronius, a son of the city prefect. At once he became passionately attracted to her and tried to win her by precious gifts. Agnes repelled him, saying: "Away from me, food of death, for I have already found another lover" (r. Ant.). "With His ring my Lord Jesus Christ has betrothed me, and He has adorned me with the bridal crown" (3. Ant., Lauds). "My right hand and my neck He has encircled with precious stones, and has given me earrings with priceless pearls; He has decked me with lovely, glittering gems" (2. Ant.). "The Lord has clothed me with a robe of gold, He has adorned me with priceless jewels" (4. Ant.). "Honey and milk have I received from His mouth, and His blood has reddened my cheeks" (5. Ant.). "I love Christ, into whose chamber I shall enter, whose Mother is a virgin, whose Father knows not woman, whose music and melody are sweet to my ears. When I love Him, I remain chaste; when I touch Him, I remain pure; when I possess Him, I remain a virgin" (2. Resp.). "I am betrothed to Him whom the angels serve, whose beauty the sun and moon admire" (9. Ant.). "For Him alone I keep my troth, to Him I surrender with all my heart" (6. Ant. ).